Let’s begin with praise for the Grimsby Public Art Gallery. The two Biannual exhibitions I’ve experienced since my relocation to Niagara, and several individual shows I’ve seen there in that same span, have acted as introductions to various excellent artists. Many regional galleries in Canada punch above their weight, so to speak, and GPAG is among them. One of those artists is Janny Fraser, who’s sculptural works in the less recent of those shows was a highlight of somewhat disjointed exhibition (or diverse, to put it differently, in terms of media and concept, but group shows based on regional frameworks are often that way). Her Dwellings Lights Sculpture was one of only two ‘floor works’ in that show, but it played symbolically with ‘house’ in terms of some of the forms in the self lit sculpture. Dwellings, as installed at the Grimsby Public Art Gallery. This aspect of place and domicile is an interesting one to consider, as I recently spoke with Fraser in Welland (where she lives, though she has a significant history with Niagara Artist Centre in St. Catharines). Our conversation was as much about the history of the ‘Rose City’ as expressed in heritage sites (I’m a walker who likes to roam the cities I visit in this manner), and also about the future of Welland in terms of who lives there, who can live there, and who might live there in the future. This concern of Toronto ‘flight’ and the demographics in the ‘rust belt wonderland’ (to quote Welland artist / cultural instigator / activist James Takeo) informs my response to her work, but is something, in terms of her materials and her own history, that is implicit, if subtle. A quick teaser: over my last month in Welland I’ve engaged with a number of artists and instigators in said community, posing a simple question: What is the state of the arts, especially as pertains to visual arts, in Welland? The seed for this was planted at a larger conversation that took place at AIH Studios on East Main there, as part of the Rodman Hall 5 x 2 Visual Conversation series. That evening, a lively debate took place over whether this is a site with untapped potential or if it is as much of a spent wasteland as the Atlas Steels site. I’ve written a few things, available online, that touch upon works installed in Welland that give some base to that conversation (Bas de Groot’s Welland Workers Monument, or Rod Dowling’s tubular metalwork that seem like the industrial arteries of the city bursting out of the ground, like a past trying to assert that its not ‘gone’…). I’ll be offering further takes on this, citing ideas put forth in dialogue with cultural producers and proponents here; the taste I offer now is that sometimes there is a ‘profound negativity’ (unsurprising for a community that took a hit like the 2009 John Deere closure) but also a renewed will (as Takeo puts it, and I’ll expand on in the future, the city is eager to support the arts, but with stutters in the past like the Murals and Canoe project, are not sure how to go about doing that….). Late Day Sun I, from the Urbanization Series. Time Images, at the Carnegie Gallery, Dundas, ON. Landscape Transformations, Gathered Environments or Sense of Place are all titles but also serve accurately and evocatively as descriptive responses. Organic elements are often incorporated into her works, and elements of the everyday (chairs, boxes, books) take on a new life and different meaning through how Fraser augments and enhances their appearance and thus changes their being and how they’re ‘read’ as works of art. The ‘tables’ in Fragments, when it was at the old NAC space, or Parallel Metaphors in Cambridge, or the ‘cases’ that seem like tiny toy houses but when opened up reveal innards that are both intricate and reminiscent of clockwork are all objects that transcend their ‘original’ source or state. River, from the Time Image Series. In Time Images, when it was at the Dundas Art Gallery, the works on the wall and the manner in which the ‘chairs’ have been worked by Fraser make them a singular artwork more so than individual pieces. In several of her descriptive notes about her works, you can see how though focused upon a certain piece, that it can also be applied to others: The porcelain mosaics are imprinted with numbers, found objects, letters, and timepieces to suggest the fossil remains of traces left behind in the process of change, fracture, and transformation. As she uses somewhat banal objects (wood, chairs), Fraser also has an “ongoing series of altered books [which] provide a narrative, questioning the sustainability of high density urbanization, congested highways, as well as the loss of a sense of place as a result of globalization.” Its interesting to consider that in the century since Duchamp’s ‘appropriated’ the mundane and by positioning it in a gallery to isolate and highlight what we might look at everyday but not ‘see’, that numerous artists have expanded that sentiment; oftentimes taking the best of that immediacy and still insinuating the artist’s ‘hand’ to guide how we might interpolate this simple thing that is, perhaps, not so simple, and that is not so much inanimate as a repository for ideas and ideologies. After all, Fraser’s ‘house’ work Dwelling, that I saw at GPAG, also came to mind when I reviewed The Tent Project there, several years later, when that show fell significantly short artistically and conceptually. In that respect, Fraser’s works are both amalgamations of objects but also ideas, and offer different points of access to the viewer based on what they bring to them. Gathered Environments, Niagara Artist Centre. Janny Fraser’s work can be seen at the Jordan Art Gallery, or at her own site (jannyfraser.com). All images are courtesy of the artist, or from her own site or that of the Jordan Art Gallery. The header image is Horizon Lines, from the Urbanization Series. Gabrielle de Montmollin’s work exists on multiple levels of interpretation and appreciation. When I encountered the art she had in the latest incarnation of the Grimsby Public Art Gallery’s Biannual Exhibition, I laughed out loud. Another piece, in this series (Lizard Legs Mash-up) that I saw in the gallery / studio / living space in Welland (AIH Studios) she keeps with artist Tony Calzetta, was all sexydirtysilly, on first impression. But – as with Gold Bowl, Black Boots and Miss Pink and the Giraffes (from the GPAG show) – when I carried the images away in my mind and considered them later, they all became more disturbing, eerie and unsettling. All the works in the series Dreams, Delusions, and Other Traffic Circles are colourful and attractive, and although Montmollin is a prolific artist whose extensive history of images (exploring both aesthetic and politic concerns) can be seen at her site, this is the [doll’s] body of work that has garnered my attention, here. This irreverence, this dramatic (perhaps of the theatre of the absurd) staging of scenes by Montmollin is an excellent repository for the viewer to construct stories, or invest their own experience. Tomato Wedding, for example, was the inspiration for an entertaining conversation between the artist, myself, and several others when the three person exhibition Now Here was on display in Welland. The wedding couple dolls face a surfeit of tomatoes (as someone who grew up half Italian, and have found that heritage – in a real sense, in an artificial sense – can be like being cornered by a bunch of tomatoes, like muggers in an alley, like a swarm of hegemony, this piece is (again) superficially funny but scratch that glossy veneer and its more disconcerting). Or maybe I was reminded of all the cherry tomatoes I’ve been picking these past few years, more for my parents than I.
Clementine Coven, with its tiny delicate high heels, or Ménage à trois, which is not what you’re thinking, at all (even through there’s a duck in this tableaux and I was thinking of Leda and Zeus. If that piques your interest, you can visit the AIH Studios in Welland, to see that to which I allude, for yourself). At their feet has an amusing ‘pop your heads off your dolls’ referent, but knowing Montmollin’s work and having spoken to her on numerous occasions, about her art, my writing, and the larger art / social worlds we exist within (or against), I get a bit of Judith and Holofernes here, or maybe a bit of Salome and the Head of John the Baptist. In considering the repetition of the wallpaper, the scenes being “staged” in the same “space”, there’s not just a theatrical context to consider, but perhaps also how different ‘classics’ can be remounted in different ways (I think of a version of King Lear I saw staged as a British military drama, replete with uniforms, or how I’ve played Puck in a contemporary restaging of A Midsummer Night’s Dream, where Titania, Hippolyta and Helena were all (simply fabulous, ahem) drag queens). We reinterpret stories to keep them alive, or to make them real, to ourselves and others. Her career / practice is extensive and I offer you here only the most recent glimpse of what she’s done: she “began her career in television and film before switching her interest to still photography. For many years she worked exclusively with black and white film photographing throwaway plastic toys and dolls arranged in constructed, fantasy settings. She developed darkroom manipulations using extreme bleaching and painting and drawing on paper negatives. Since realizing that digital photography did not provide her with the same creative possibilities she has been working with mixed media blending painting, drawing and montage elements with digital prints.” She’s exhibited in many solo and group exhibitions in Canada, the United States, Belgium, Italy, France and The Netherlands. The website for AIH Studios (also known as Art is Hell Studios) offers many examples of past works, and I encourage you to visit it, as well as their gallery space, in Welland. In a recent conversation about the downtown of STC, we all agreed that many of the spaces along St. Paul offer interesting and engaging art works (frequently for sale). As I was enjoying June-Etta Chenard’s latest exhibition in the city (located at Mahtay Cafe and Lounge, which you hopefully visited this past December), I realized it was a year ago that she exhibited in the Dennis Tourbin space at the Niagara Artist Centre (So Invisible was the name of that selection of works). That previous show was my first encounter with her works (I’m sure I saw some online, as we intersect with similar social circles), and their detail, discipline and the nature of the materials she uses and the intensity of her practice is still evident in the works from this past December. Many of the works in Interior Landscapes at Mahtay have a specific narrative that sometimes is intrinsic to fully appreciating them, and other times they can simply be enjoyed viscerally and aesthetically. This is a good overview of June-Etta’s practice: there are works that are intensely vibrant, like Homage to the Sun Dancer or Voix des femmes / Voices of Women, with rich reds and deep blacks and then (in Homage) a soft snowy white that invites your touch. This is similar to how Where Am I? Where Are You? doesn’t seem to be on paper but on some form of cloth, the folds and divots in the surface leading down to a yellowing “stain.” Chenard nd often uses papers such as Wenzhou Chinese Rice Paper, or Japanese Gampi Tissue paper in her practice. Yet other works defy this physicality, seeming almost ethereal and ephemeral in the lighter, translucent colours and hues, with a layering of shapes and forms that seem almost dreamlike. Offer New Propositions or Prayer Kite Arising are among these more “delicate” pieces. Chenard has exhibited nationally (New Brunswick and British Columbia, so nearly fully from East to West) and internationally (including Virginia and Pennsylvania). Her experience is diverse, and activism plays a strong role in a number of her works, such as Schools I Didn’t Learn In School, which lists the names of Canada’s many – far more than many know, or want to know about – residential schools. In the aforementioned Where Am I? Where Are You? Chenard lists the traditional Indigenous names of the places she’s lived. This mixture of personal and political is also present with In A Soldier’s Billfold, that incorporates photographs of herself, her mother and father that her father carried with him. June-Etta’s works are dense: not just literally, with the layers and objects and elements enmeshed within the works, but also in terms of the ideas and histories (both her own and those various sites she’s inhabited, and we inhabit). She’s an artist whose work I enjoy encountering when I have time to spend with it, or can visit repeatedly, as the visual acumen she displays entices me to pay attention to the particular aspects that expand and enhance her work. Interior Landscapes was on display this past December, but I fully expect to see more of her work in the future at NAC or among other sites in Niagara. Avery Mikolič- O’Rourke’s aesthetic of image and time. It will come as no surprise that I don’t always behave in the prescribed manner in gallery spaces (perhaps this is because, at an early age, I absorbed Atwood’s idea about how galleries are such serious, dour spaces that seem too sanitary, like someone’s gone around spraying air freshener to eliminate the smell of blood..and I’m not referencing Istvan Kantor, if that means anything to you). When I asked him, as a point of beginning, to describe his work briefly, perhaps with less an eye to detail than language designed to intrigue, he spoke of how he’s often examining the detritus and minutia of daily culture, both as it pertains to “pop culture” but also within our surroundings (average daily life acknowledging his demographic and how who we are is often defined by these things). We revisited his piece in ITS, but also another work – TMBS_remix003/511 – that shared aesthetics / formal concerns, and even some of his painted works, such as Refuge Triptych or Smoke Break. In his practice, he often follows the concept, the idea, and that defines what medium is employed to fully realize the artwork. And, some pieces may stretch over several media before completion. 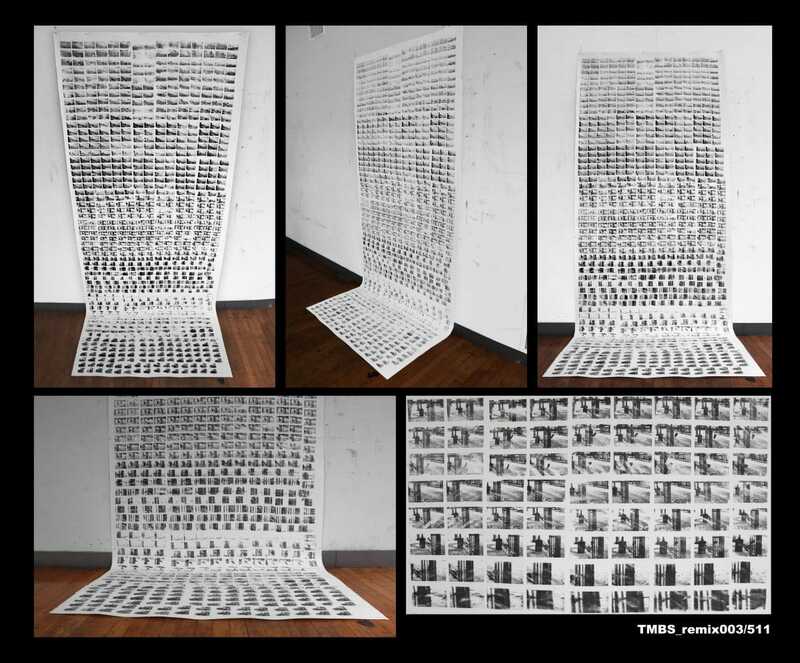 TMBS_remix003/511 is a series of image transfers in a large wall work that originated as a small video clip, exported at 24 frames / second, then arranged digitally in a grid format. The “stills” are sized out and printed on standard sheets, in a monochromatic frame by frame rendering. This “silly, random” video shot behind the bus terminal shows a simple plastic bag blowing, floating in the wind. In some ways this was so cliched and uninteresting, but also quite stunning aesthetically (an amusing contradiction, “documenting” the irrelevant that becomes a rare unexpected moment of beauty and amusement to be examined, to be broken down into segments and “fractured” – not in a pejorative sense but more-so in terms of examining it second by second, “breaking it open” to try and understand why the scene entices and attracts). There’s something disconcertingly but undeniably erratic and perfunctory about the images, whether moving or still, or in the translation (with the suggestion that some things may not survive the process, or are changed, radically, in the steps) from one to the other. To come back to the musical performances that are also an intrinsic part of Mikolič- O’Rourke’s practice, and the aforementioned masks that are the latest example of performative gestures by different groups he’s collaborated with, I want to cite Jacques Attali’s theories of music. Essentially, Attali postulates that performances are unique, and more “true”, than a recording, which is codified, set, and dead: live performances shift with the musician and the audience, and exist more so in memory, in a personal “examination” of the event. That primacy, that privileging of a moment, no matter how facile and fleeting, is seen in both the fleeting ephemera of TMBS_remix003/511 but also in the oddly personal moments of Fiction Non-Fiction. There’s a totemic, intensely referential nature of the image(s) employed by Avery, but there’s also an implicit degradation of the same image(s) as it / they are transferred into different forms: not so much factual as imaginative retelling. The ideas that intersect in his work can also be seen in past installations, such as his work in Invasive Species (installed in the MIWSFP) or Site-Seer or Time and Space, both which were interventions in the STC downtown. Some of his video production work can be seen in Sweet T’ar or Last Night I Slept in My Car (you can find both on youtube, that space which has forever shifted video art, artists and consumption) to give you a further idea of his aesthetic and attitude. From there, you can see a few more things he’s done and is doing online, and engage further with Mikolič- O’Rourke’s unique, yet also strangely banal, aesthetic. 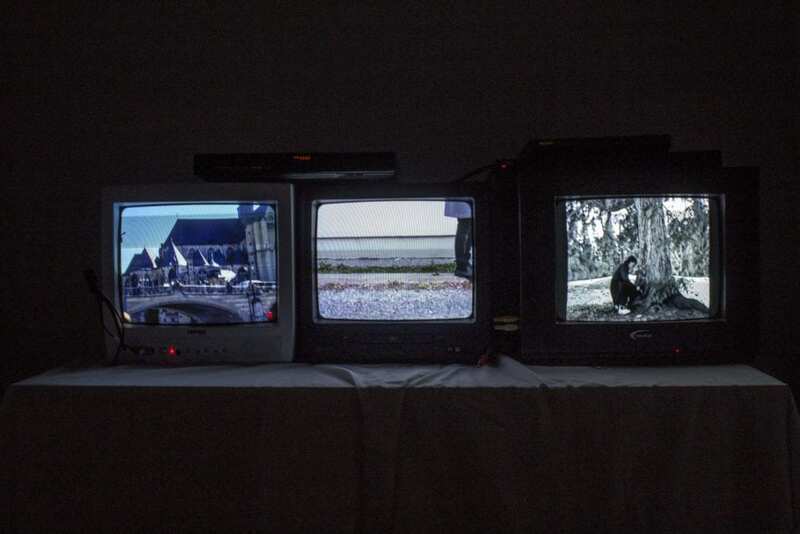 All images are courtesy of the artist and In The Soil, and are (in order of appearance) This Here Proves We Are Fiction Non Fiction (installation detail), TMBS_remix003/511, Refuge Triptych and 09_31_17.